Abstract: The first published commentary on Doctrine and Covenants Section 132 is a lengthy volume with much material that deals directly with the revelation as well as extended discussions that go well beyond Joseph Smith’s dictated text. Much of the included material has been previously published, although several new historical items are presented, including a detailed examination of the provenance of the revelation. 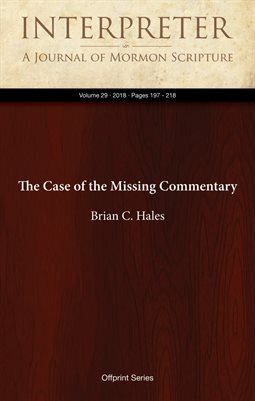 An apparent weakness of the book involves key themes mentioned in the revelation but minimized or otherwise ignored in this extended commentary. Examples include the possible meanings of the “law” (v. 6), importance of sealing authority (vv. 7‒20), possible polyandry (v. 41), Emma’s offer (v. 51), and others. Review of William Victor Smith, Textual Studies of the Doctrine and Covenants: The Plural Marriage Revelation (Salt Lake City: Greg Kofford Books, 2018). 273 pp. $26.95.